Will that be weiß oder dunkel bier bitte? Munich, in the heartland of Bavaria is pouring with beer and culture. Home of Oktoberfest; Germany’s biggest export since beer itself, Munch is a plethora of stereotypes from tourist to lederhosen. The Maypole in the centre of the Viktuakienmarkt. With a rich history in arts and science, Munich was also the launching pad for the Nazi party, with the first concentration camp, Dachau north-west of the city. Munich today is mix of multinational wealth, where the centre of finance and publishing head offices are based including Conde Nast and BMW. Despite being the most desirable expat location in central Europe and visited by millions every year, München often comes in second to Berlin, critiqued against its style and grittiness, of which Munch just doesn’t have. As a clean, wealthy city with an affinity for seafood, it has loads to offer even for the peppiest Berlin cheerleader. Arriving on a Friday morning is the best way to make the most of your long weekend. With loads of weekend events taking place year round, it can be hard to explore the city before getting caught up in the action. The Viktuakienmarkt is in the centre of town and bleeding with tourists. It is however a great way to see the local architecture and sample some of the freshest food in town. In the middle of town, you’re within walking distance to Marienplatz, the Rathaus Glockenspiel, Frauenkirche and the Sendlinger Tor, which all resemble the Bavarian-Gothic architecture of the region. 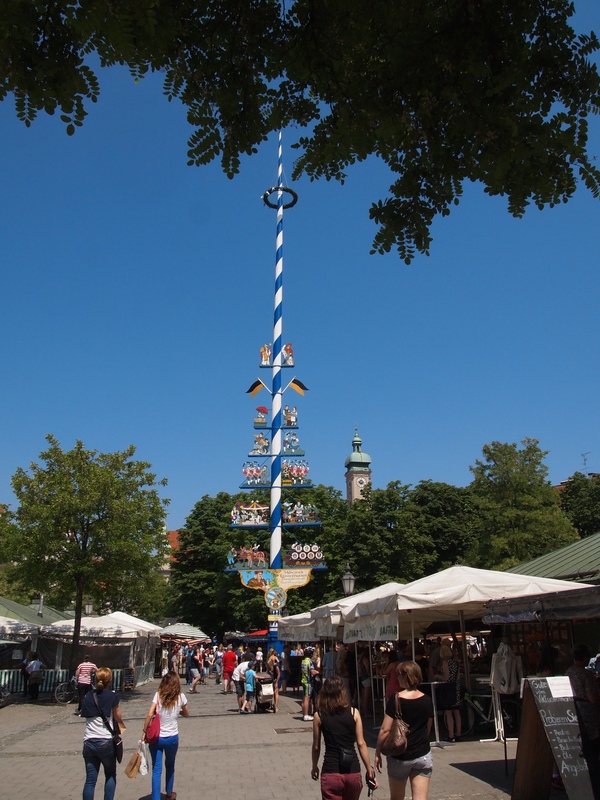 The market was a meeting place for farmers since the early 1800s and is where you can find the famous Maypole. 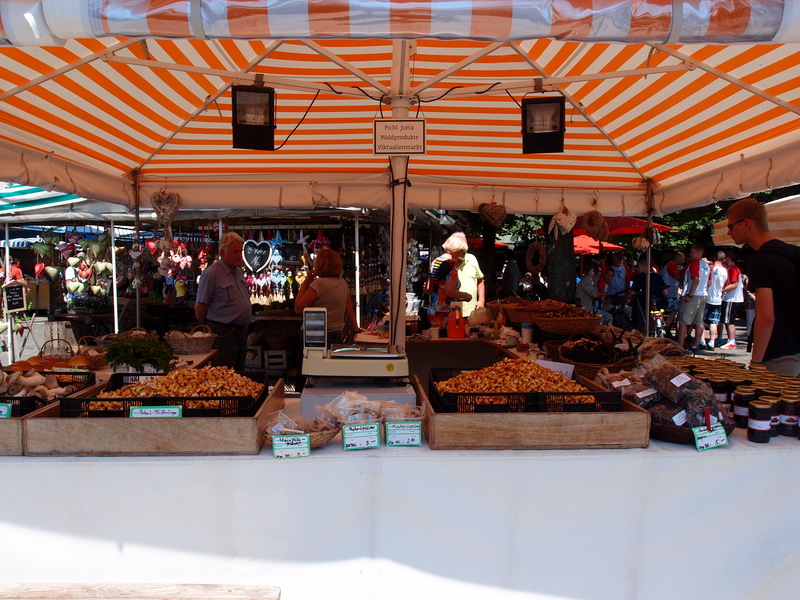 In the summertime, the space is laden with fresh warst, cheese and ice cream stands and during the winter months the square is home to the famous Christmas Markets of Munich. On Friday night, do as the tourists do and prepare for a loud and button-popping night of Bavarian tradition at the Hofbräuhaus. Founded in 1589, the brewery and beer hall has been used as a meeting place for men throughout history and was famously an early Nazi stronghold. Today, it is a place of celebration for locals who still wear their lederhosen and tourists alike, who join together in banter, singing, eating and drinking. It is absolutely necessary to order the pork knuckle and wash it down with a stein. After this, you’ll certainly be ready for bed. 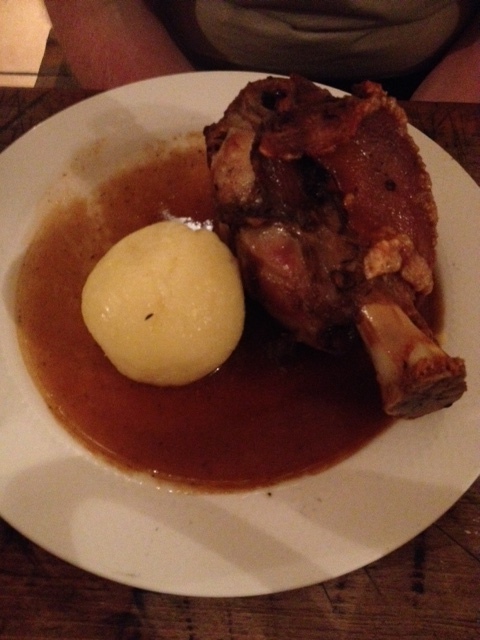 The pork knuckle and potato dumpling at the Hofbrauhaus: World Famous. Get an early start on Saturday and visit the Deutches Museum. As one of the oldest science museums in the world, the space is filled with authentic replicas and original pieces including a full size submarine, Lufthansa airplane and a sailboat. With a huge collection, it is easy to spend hours here – learning and getting lost – discovering different facts about electronics, mechanics, space and more. 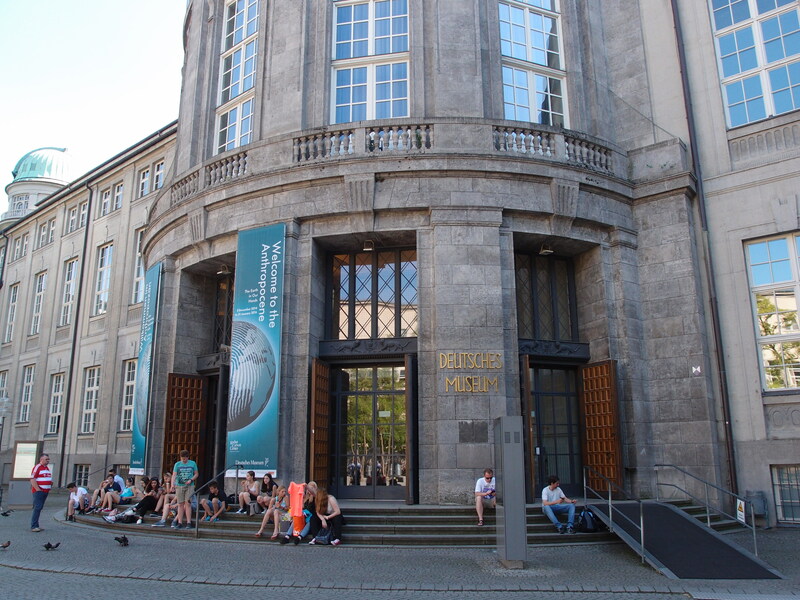 The Deutsches museum is one of the oldest science museums in the world. Like most cities, walking tours are everywhere, but here it is easy to conduct your own pre WWII walking tour by visiting the Odeonsplatz, Park Café and Oberfinanzdirektion office. All located near the Hauptbahnhof these buildings are quintessential stops. 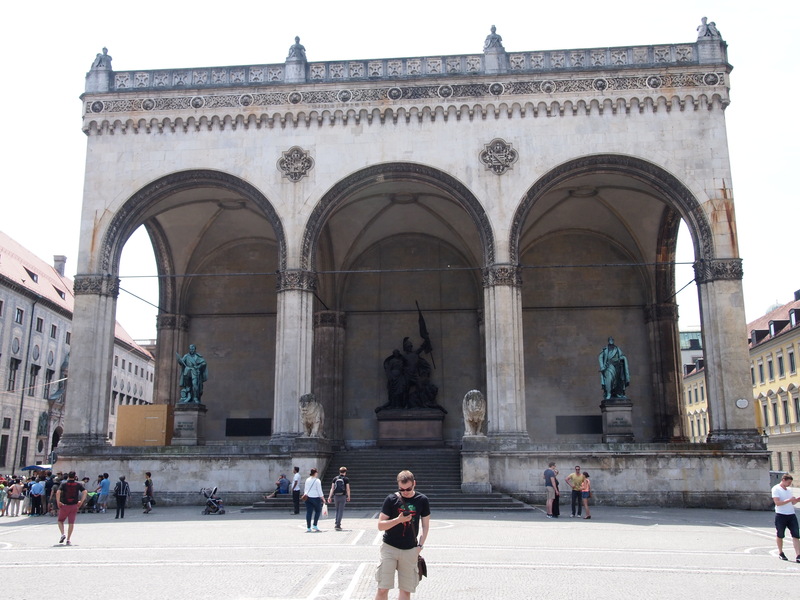 The Odeonplatz is a beautiful square joining the Munich Residence and the Theatine Church, which was the stage for the Nazi parties first (and failed) uprising the Beer hall putsch in 1923. Around the corner on Sophienstraße, you can see the famous Park Café; a frequent meeting place for political meetings over beer, now used as a stylish restaurant and beer garden for the staff of Conde Nast, who have their offices, just a few metres away. The Oberfinazdirekion office, still in use today, is one of the few places left in the city where you can see original Nazi iconography. After all that walking and sightseeing, it is time to relax in the shade at the Englische Garten. With acres of parkland, the garden is used for sun bathing, sport practice, horse riding, running and even surfing on the inlet created for just this purpose. Scattered around the park are several beer gardens, however, in the centre clustered around the 25 metre high Chinese pagoda is the a main biergarten. Serving Hofbräuhaus beer, pork knuckle, bretsels and kartoffelsalat, the beer garden is a beautiful and popular way to watch the sun go down. 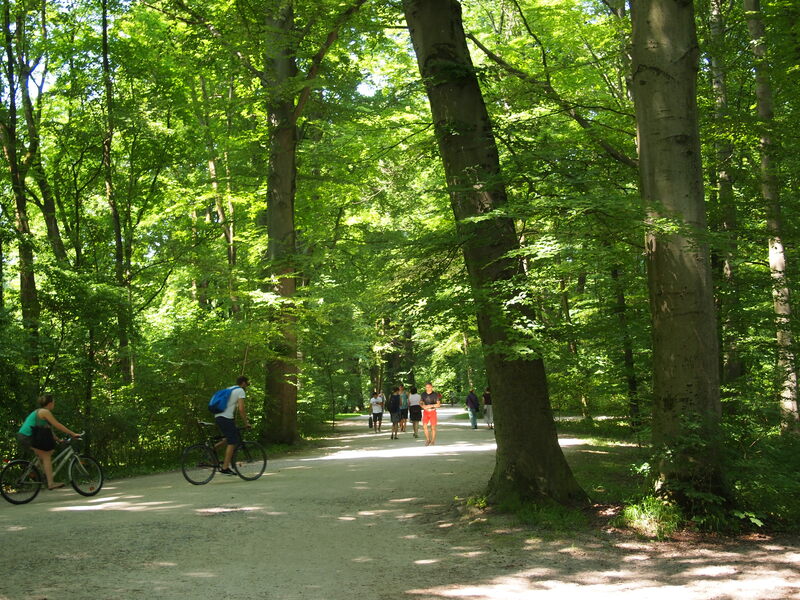 Englische Garten has many open green spaces and dense woods. Take advantage of the 1 Euro museum entry on Sunday where you can experience local Bavarian, German and international pieces from various periods all day. With works such as Van Gogh’s sunflowers and early works from Degas, Edvard Munch and Gustav Klimt, the Neue Pinkothek Museum and the Pinkothek complex that includes the Pinkothek der Modern and the Alte Pinkothek ranging from neoclassical paintings to contemporary works are well worth a visit. Before departure, one more German biergarten is in order. 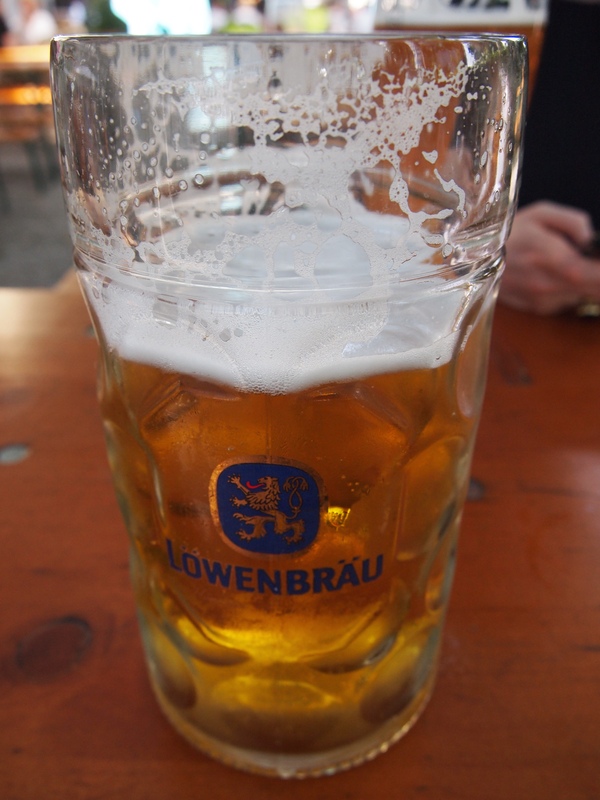 The Loewenbraeu is a small alternative to the Hofbräuhaus with indoor, terrace and outdoor dining from the al la Carte and a table service restaurant. A local rival of Hofbrau, Loewenbraeu has a great selection of beers not often found outside of Bavaria. 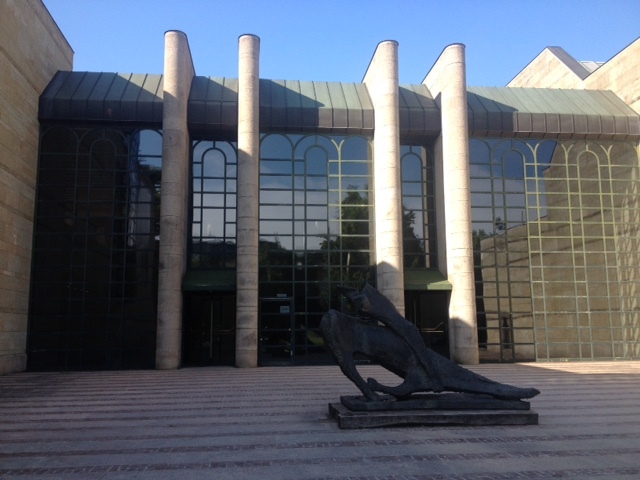 It is also home to the Oktobrefest museum. The remains of a Weißbier stein at Loewenbraeu. Munich is a small but delightful city to visit over a weekend. Celebrating their rich, arduous and colourful history, the city offers a contemporary insight into Bavarian life with just a touch of traditional garb.